3. Get £5 free bet in your account for each match they win during the tournament! Take adavantage of the best betting offer on this summer's Euros! Free bets are paid if England win in 90 minutes, extra time or on penalties. Hence, if England enjoy any sort of decent run in the competition you should realistically be looking at £15 to £30 in extra free bets. Of course, it should be enough to cover your £10 bet on England, meaning you have effectively had a free bet on the Three Lions! The £5 free bet tokens for this England offer will be paid by midday following any England wins and are stake not returned free bets, valid for a week. Applies to bets placed on our ‘England Euro 2016 Free Bet Special’ market only. Applies to bets placed from 00:01 on 27/05/2016 until 20:00 on the day of England’s Quarter Final, should they qualify. This date would be either 30/06/2016, 01/07/2016, 02/07/2016 or 03/07/2016. Free bets paid if England win in 90 minutes, extra time or on penalties. Applies to single bets of £10 or more. Applies to the Win part of Each Way bets (£10 EW or more). A maximum free bet of £5 per customer, per winning game. Cash-In will not be available on this market. Any bets incorrectly cashed in will not qualify for a free bet. Applies to all bets placed via Internet, Mobile and Text. The offer will not be available in Retail or on SSBT ’s. Free bets will be paid by Midday the day after each winning England game. If the free bet is partially redeemed, no change or additional free bets will be awarded. Bets placed using free bets, either fully or partially funded by a free bet, will not qualify for this offer. We reserve the right to cancel or amend this promotion at any time and without prior notice, including changing the odds stated in the TV advert . 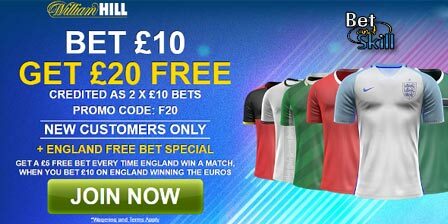 "William Hill Euro 2016 Free Bet Special: £5 free every time England win a match"